After one of the warmest Decembers ever recorded, Minnesota's lakes have finally iced over. But the ice is still too thin in many places to drive on, or to support heavier ice-fishing houses. That's taken a toll on Dan Jasper's ice-fishing business at Lake Minnetonka. He rents out big fish houses — the kind with heat and other comforts. "You know, I've got big-screen TVs," he said. "It's like fishing from your living room. And to be able to provide that with thin ice is almost impossible ... I need 11 to 12 inches before I can go out." So Jasper has been checking the ice conditions every few days, drilling holes and measuring ice thickness. "Here we have about 8 inches," he said as he checked one spot. But he pointed out that only half of that was hard, clear ice; the rest was probably melted snow. And so he'll wait. That's been the story this season for Minnesota's winter sports enthusiasts. In December, it rained in Duluth, and much of the state had little to no snow cover. 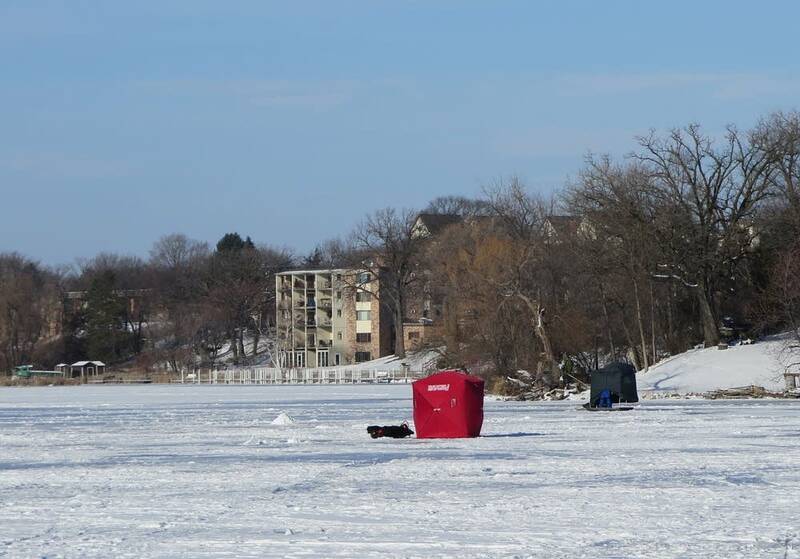 On average, Lake Minnetonka freezes over by Dec. 7; this year, it didn't happen until New Year's weekend. Pete Boulay at the State Climatology Office has been keeping track of ice-in and ice-out dates. 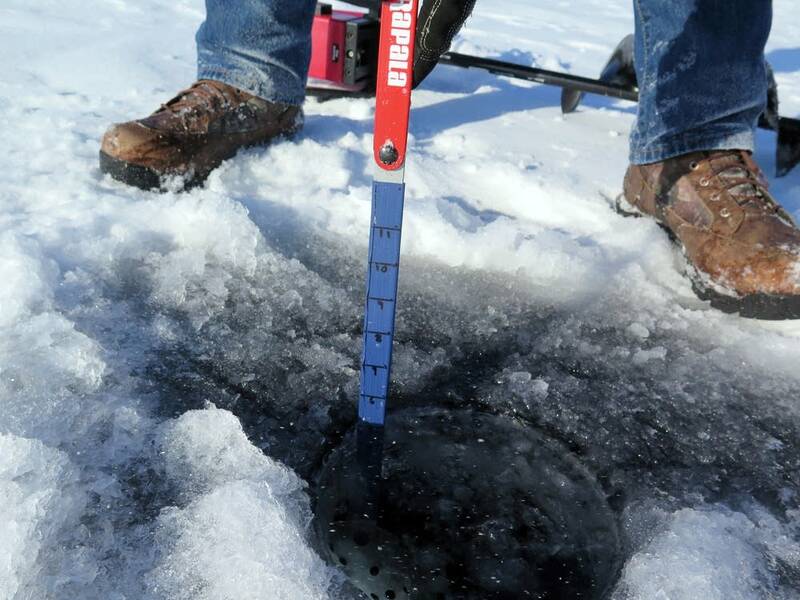 It's an inexact science, but he said at least a few lakes appear to have either broken or come close to breaking records for their latest ice-in this winter, including Green Lake northeast of Willmar. "They were water-skiing on the lake on Christmas Day, and then they were ice-boating on Jan. 2 and 3, and they had 50-plus boats on the new ice," he said. 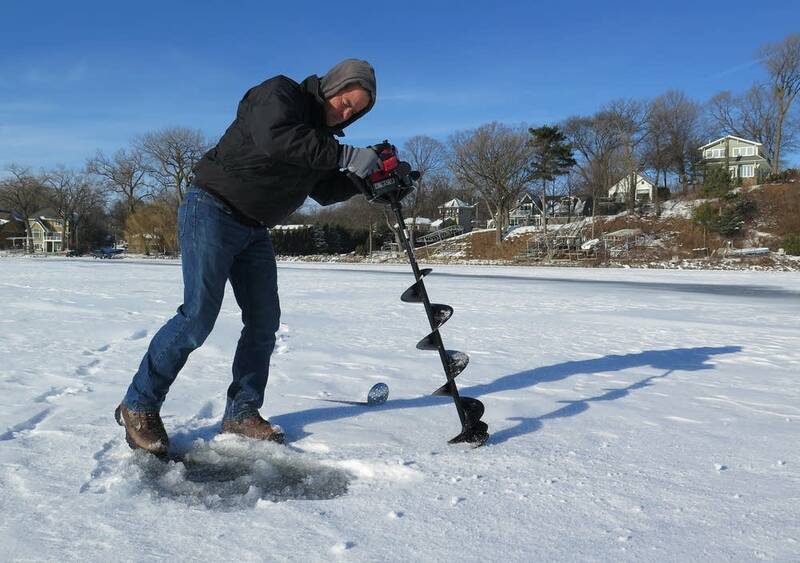 Tracking ice-in dates is tricky, Boulay said, because you have to have eyes on different parts of a lake and come to a consensus about when nearly all of the lake is ice-covered. There's also the possibility that a lake can freeze over around Thanksgiving and then thaw again, which happened in some places this season. And even if a lake is fully covered, there's no assurance that the ice is safe. Boulay said things are running about a month behind, and our first real arctic blast won't happen until this weekend. "It's the third-warmest December in the Twin Cities and we had a warm fall to boot," he said. All in all, it's the kind of winter that climate scientists get excited about. One factor is this season's strong El Niño, a phenomenon that involves the pooling of warm water in the eastern Pacific near the equator. The typical effect in Minnesota is a milder winter. We've definitely had a milder winter so far. But we've also had a very wet winter — precipitation is 200 percent above average. "You're looking at really an abnormal situation," said University of Minnesota climate scientist Peter Snyder. "And so what you start to ask is: Where did all that moisture come from?" Snyder and other scientists are looking at factors other than El Niño that also influence our weather. One is the huge jump in temperatures in the Arctic as compared to places closer to the equator; this is referred to as polar amplification. It could be why the North Pole got above freezing last month. The other factor is a longer-term warming trend; Minnesota is among the fastest-warming states in the winter. These factors — overall warming and the exceptional warming we're seeing in the Arctic — can both be traced back to climate change. So how much can we attribute this wild winter to El Niño, and how much to climate change? Snyder said it's hard to separate the two. "We'll start to look at those things that either independently contribute to climate change or El Niño, and then look at their interaction together," he said. "We're always going to get El Niños, we think, so the question is, are El Niños of the future going to look significantly different than our El Niños of the past?" In fact, the National Climate Prediction Center's forecast for this El Niño season hasn't been very accurate. Kenny Blumenfeld of the State Climatology Office said scientists have a ways to go in understanding what types of weather we can expect El Niño to bring against the backdrop of a changing climate. "I don't think El Niño is ever going to be a four-sentence-explanation kind of a problem," Blumenfeld said. "There's an awful lot that the best scientists are still trying to figure out." Blumenfeld said the work is important, because it helps people plan everything from planting crops and prepping snowplows to ensuring a reliable supply of drinking water. "We know El Niño is recurrent," he said. "We know that somewhere between every four to seven years we'll see it recur with varying levels of intensity. We want to have a better sense of what that really means. What does that mean for Davenport, Iowa, for Minneapolis, for Crookston?" Climatologists agree that the lake ice is likely here to stay for the winter, but how long the season will last is still a guessing game. "That would be a four-month forecast," Boulay said. "So I'm not going to go there."